It's late here in England today, however it's still September 14th, so I think it's about time I updated my blog, and did my once-a-year Birthday post! And no, this isn't for the blog itself, but for me, because I'm so into myself and feel the need to let y'all know that I am now -drum roll- 23 years old! Huzzah!? Being in University, I made the decision to leave earlier than anticipated to the City where I study this year in order to find a job and basically aid myself in paying for bills and necessities (read: food and HouPri CD's) and, for the first time in 22 years, I have experienced my Birthday without my best friend. I was sad, and I nearly did cry (I always cry), however it doesn't mean that the day I had was terrible, because it was far from it! Without my sister by my side, it felt like I was missing something, but I know we have to grow up and move on sometimes, even if it means we won't be around each other. Honestly though, despite not being with my family for the first time on such a day, I still did have a good time, and that's because I was with my friend, and also because I was able to talk to my mother and niece, and text my wonderful, beautiful sister! My friend truly made the day wonderuful, because 1) She bought me lipstick, and y'all might know I like lipstick! 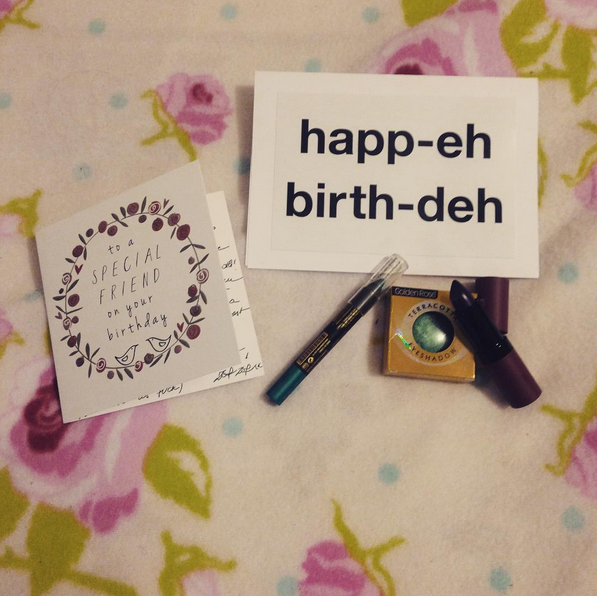 Then 2) she also bought the best card ever that basically screams me, because ever since moving to my University City, I use 'eh' at the end of my sentences to mimic the dialect, either by accident or on purpose for the sake of it. 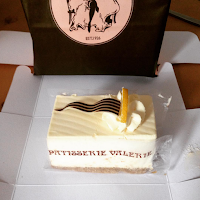 Oh, and 3) SHE BOUGHT ME CHEESECAKE! I loooove cheesecake, and this is one of my favourites from a patisserie we sometimes visit, so I was rather chuffed with her when she told me she bought it! Seriously though, she did make my day happy, and even though I had work afterwards, it's been a wonderful day all around, and whilst I am sad I didn't spend it with my sister, I know that this is a part of life, and a part of growing up. This is how things are sometimes, and I accept that. In news away from my Birthday, and something I never formally announced when it happened, last month in August I hit the 500,000 pageviews mark!!! That's a lot of views, like half of a million or something? I cried when I saw it, but I gathered you already knew that. If you noted that I mentioned going to work above, then yeah, it's true, I now have a job! I've been working as a Waitress at a Restaurant for a week now and honestly, I really enjoy it. The people who work there are great, and the customers are just as lovely, too. It's a nice place, and whilst I don't have as much experience at waitressing as others, I am really excited to learn from everyone else, and to meet new faces every day! Oh, and my co-workers sang Happy Birthday to me today too, but thankfully there was no one around at that point customer-wise to see, so haha! ... And that is all, I believe! It's been a hectic month so far, what with moving into my new shared house and looking for work, but it's been fun and worth it! I'm happy with where I am right now, and today I really felt that I was at my happiest since arriving back in my University city. To everyone who wished me a Happy Birthday, watched a video of mine or read my blog, I thank you all from the bottom of my heart. You're all amazing, and also, I apologise for not updating more, but this is the truth: I have been busy! Until next time my lovelies, I hope you all take care, love Idols, and live happily! So many updates. I'm glad you're doing well in your life, Chiima. In the belated words of Kousei Kougami (aka Cakeboss), HAPPY BIRTHDAY!